Today was the second of our “Ten-Minute Tech Talks” this semester. We were glad to see more than 20 folks join us for presentations and discussion that built in momentum as the hour passed. 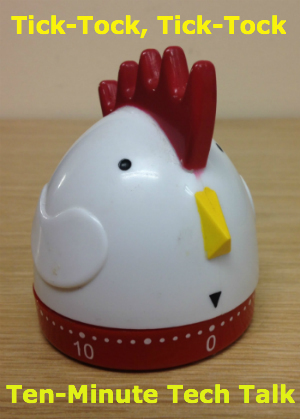 As before, we were joined by our steadfast timekeeping chicken, who never fails to keep things moving. In the next presentation, Maria Rios (Spanish) introduced the use of private Facebook groups for extending the dialogue of the classroom, exploring questions of identity, community and culture, and encouraging students to further integrate Spanish learning into their daily routines. Following this, Shiri Goren (Hebrew) showed us her use of blogging with WordPress for writing work in two of her L5 Hebrew courses. It was clear that each of these three environments (etherpads, social networking groups, blogs) creates many possibilities for new forms of collaborative, engaged, and socially-oriented writing in the L2 classroom. While important differences between them can be discussed, what struck me immediately was the frequency of questions of grading posed by members of the audience–and, in fact, by the presenters themselves. How is a language teacher supposed to maximize the potential and make students comfortable with the very public nature of writing in these online spaces (even if the public is only the other members of the language class), while still giving direction, feedback, corrections, and sometimes grades to students for their use of new or unfamiliar L2 forms? This is a persistent question in the literature on the use of social media for second or foreign language teaching; you can get a good taste of this by reading some of the work of Lara Lomicka Anderson and Lara Ducate (in the French and German programs, respectively, at the U. of South Carolina). There’s an interesting forum on HASTAC (Humanities, Arts, Science, and Technology Alliance and Collaboratory) called “Grading 2.0: Evaluation in the Digital Age” that might be of use; here’s an example of a blogging rubric consisting of 4 point levels in 5 categories, shared by high school educator and administrator Ryan Bretag. And in the meantime, it’d be great to hear your thoughts about this and related questions in the comments on this post. Have you used Facebook, blogging, collaborative semi-public writing tools like MoPad, or other social/collaborative media in your language classroom? And if so, did (or would) you assign credit or grades for this work? Why or why not? What challenges does ‘public’ writing in social media pose for grading in the language classroom? Oh, and before I sign off on this post, I wanted to say thank you again to everyone who came to the tech talks, and to remind you of a few things: We’re looking for presenters for our final Tech Talks for this semester, scheduled on December 4 (Wednesday), from 12:30-1:30 in the CLS library. Please sign up to speak using this Google spreadsheet, or email Dave or Russ to talk over your ideas. 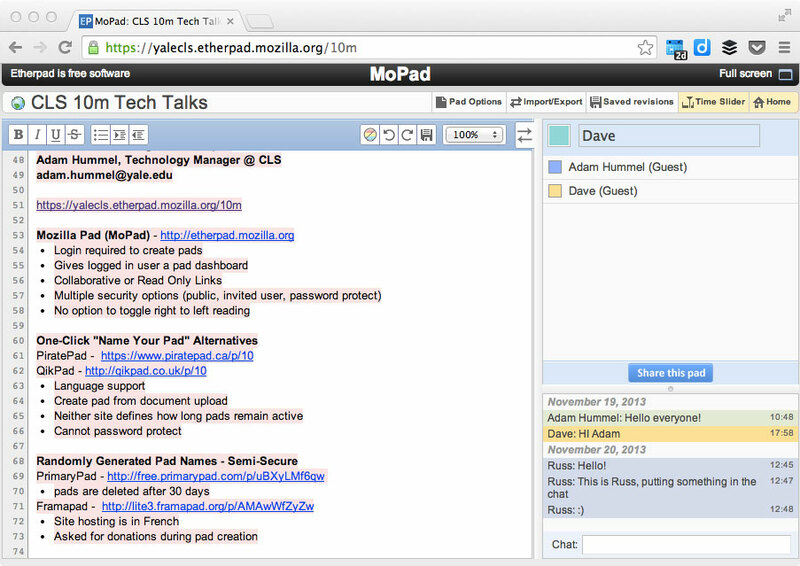 Also, we’re sill adding the tools mentioned in the tech talks to the CLS Diigo group; feel free to join and share other technology resources and sites that you’re find interesting.